Batteries vs pumped storage hydropower – a place for both? The rapid growth of renewable energy generation has been driven by two concurrent factors: the falling levelised cost of the energy produced by wind and solar, and the retirement of a number of coal-fired power stations. The recently released Finkel Review notes that by 2035, approximately 68 per cent of the current fleet of Australian coal generating plants will have reached 50 years of age. Renewables can’t, on their own, meet the fluctuations in demand that occur throughout the day without some regulation as to when power reaches the grid. Power needs to be dispatchable. Dispatchable means that energy can be provided upon request. If the sun is not shining or the wind is not blowing, renewable energy cannot be dispatched unless it has been stored in some way. There are a number of different types of storage but the two being discussed most widely right now are batteries and pumped storage hydropower. These two technologies are very different and there are some limitations involved in comparing a well-known and established technology with one that is new and developing rapidly. Battery inverter technologies are still catching up on most of these fronts. The potential for batteries to provide ‘synthetic inertia’ or fast frequency response is high but this is balanced by their reliance on system strength to be able to deliver this support. They offer minimal support with fault levels but can still provide some support to system frequency and voltage regulation. There’s no doubt that battery storage is quicker to implement than pumped storage hydropower. South Australia has provided an example of just how quickly battery storage can be deployed. In March 2017, the South Australian Government called for expressions of interest for the supply of grid-connected battery storage to be connected by the end of 2017. The overwhelming response from 90 interested parties tells us that this speed of deployment is within the realms of possibility. According to the Lazard’s Levelized Cost Of Storage report, capital costs for pumped storage projects around the world range from about $1.5 million to $2.5 million per MW installed. The report also reveals that the cost of installing a grid-scale battery solution ranges from about $3.5 million to $7.5 million. This wide range of pricing for batteries is typical of a developing technology that is implemented in a variety of applications. Considering that batteries need to be replaced once or twice a decade, with the currently available technologies, a battery facility will need to be replaced a number of times during the potential 100-year life of a pumped storage project. For batteries, assuming an economic life of 40 years, the initial cost plus replacements may mean whole-of-life costs fall in the range of $200/MWh to $330/MWh. Batteries are here to stay and will undoubtedly play a significant role in future power systems as the technology develops and costs fall. 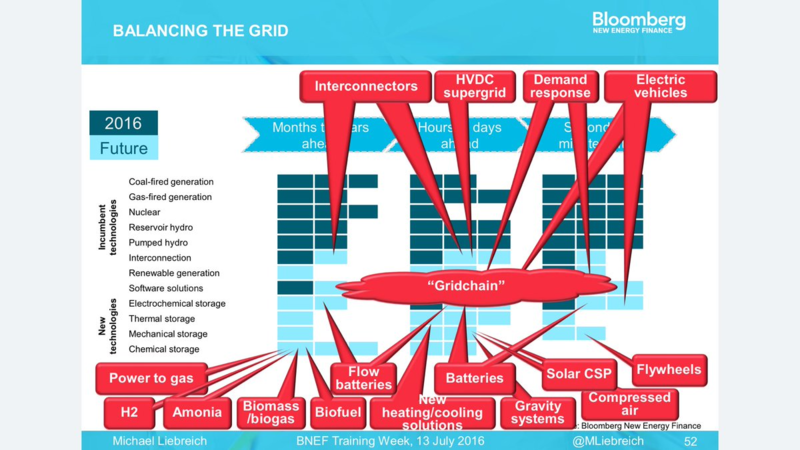 However, while batteries can provide fast response times, they are yet to demonstrate their ability to provide the full range of ancillary services needed to support the grid. Pumped hydro remains a landmark, proven and reliable technology, able to meet the needs of the grid and provide sustained output for up to a century. Ultimately, there is room for both batteries and pumped storage hydro, and they may even complement each other. Batteries are more cost-effective at delivering small amounts of stored energy over a short time at high power levels. Pumped storage is more cost-effective at storing and releasing larger amounts of stored energy. Achieving the optimum storage solution will depend on careful planning and finding the best fit for the particular circumstances. I suppose the most important issue re pumped storage hydro is the Geo-morphology of the area where energy is needed followed by the availability of sufficient water – fresh, brackish or sea, to allow for a viable system. 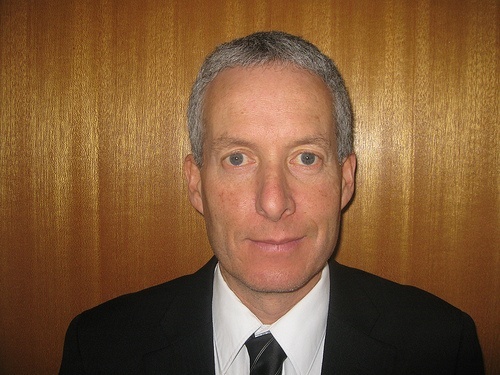 Could we have some idea of the requirements for pumped storage hydro in future articles. From personal observation landscapes over large areas of Australia are fairly flat with a correspondingly high level of evaporation as well.. Projects in NSW/Vic/Tas are not much good for say Kalgoorlie or similar. Kalgoorlie may still be a good Pumped Hydro prospect if a large hole, such as the super-pit is used. The salinity is impressive around there, so salt preecipitation from evaporation may be an issue. Can’t you solve or at least mitigate the evaporation problem by covering the surface of the reservoir(s) with floating tarpaulins? A proposed variation of Pumped Hydro is Solid Pumped Hydro(SPH) needs 60 times less water and can be done almost anywhere with a 100m or more elevation. Does not need tunnels/dams/or birds nests. In principle SPH should be the cheapest storage solution of all. There is a shortage of water in many parts of the world , This is particularly true inland areas of many continents i.e Australia. Solid Pumped Hydro(SPH) allows pumped storage like capability with 60 times less water over a 4 hours energy dispatch period. So SPH can be done, where there in not enough water to do conventional pumped hydro. The cost of building a SPH project is cheaper than conventional pumped hydro weather using fresh water or seawater due to lower amount of civil construction and shorter distance from existing power grids.. So you claim but I don’t believe any large scale schemes have been built or even have had preliminary FS done. I’d like to see some serious calculations before accepting your claims. For Australia’s total energy use in a year a cube of water 4.5km on each side 4.5km in the air would be required. Yep. I put that their as the upper extreme end. Road transport requires it’s own portable storage. And that takes up 1/4 of the power. A lot of power will also be used at the time of generation skipping the hydro altogether. Add in the existing hydro power. How far will we need to divert aircraft away from it? Sites that have been studied around Armidale could provide GW of storage. Removal of transmission constraints to the Snowy will do much more for storage than “Snowy 2” altho’ it too will be welcomed. I’m anticipating that with behind the meter batteries and pumped hydro SA will be 100% renewable by 2022. On completion of planned wind projects in Tas, it will be drought proof and 100% renewable before that. The laggards will Vic and NSW. Would be worthwhile covering the recharge-discharge characteristics, and where batteries vs pumped storage fit in the continuum of short-term vs long-term storage. As I understand it, pumped hydro would have a near-linear rate of power production or pumping between when the storage is full to empty, whereas power output of the battery would be highest when the battery is full, and recharge when empty. The lifetime of a pumped hydro system would be relatively unaffected by the number of recharge-discharge cycles, whereas a battery more so. Batteries would be preferable for short-term balancing from seconds to a few hours, whereas pumped hydro from hours to weeks. Maintenance costs of hydro would be be relatively greater for short-term FCAS than batteries, because of the mechanical stresses it would impose on the equipment. Is this in line with your experience ? It depends but not if the change in reservoir surface elevation from full to empty is a large fraction or percentage of the maximum (when full) hydraulic head, in which case as the reservoir empties the head may become insufficient for full power generation even at maximum flow rates. Regards “weeks” of storage… that hurts the economics of storage, the idea is to cycle it as much as possible, they only earn dollars on the export (unless they’re buy power at negative prices, but even then they want to keep the turbines or the pumps spinning). As for weeks of storage, biogas is the elephant in the room. There is hundreds of millions of tonnes of feed stock from human and animal waste, not to mention green waste, that should be utilized. Consider that turning this resource into biogas can kill two birds with one stone. It would greatly reduce methane emissions, which is many times a more potent GHG than CO2. The gas burned, thus becomes part of the natural carbon cycle. A whole new industry can emerge from biogas, cleaner renewable fuel for bottled gas, to be used for cooking, BBQ’s etc, for heavy transport,( shipping) ultra peaking plants and of course enough stored, region by region for times when wind power is in the doldrums and CST, PV and storage, i.e. PHES and batteries are not enough to get us through. Fossil gas could be eliminated in the short to medium term. We need to reduce methane, not trees! Pumped hydro is the only ‘battery’ that will last more than a century. I suspect that these prices are comparing PH with a battery over a 10 year period, which is not appropriate when one of the solutions will last easily 10 times that long with only minor maintenance and modifications. In Australia, another factor is access to a large body of reliable water, which means the sea in most cases. It should also be recognised that ‘Master Chef’ has had a corrosive effect on society. It encourages knockout competition in areas where cooperation and collaboration are more appropriate, as is the case with batteries and PH. Each excel in certain areas, but do have a some overlap. Specifically in terms of time frames, I agree, I think the way in which these costs are often presented undersells the immense value of the longevity of some assets. In terms of the materials and lifecycle type issues, I think its likely we will look at this in a future article. Its certainly an interesting point of difference between the two technologies. In Scotland, wind power is available all year round whereas our winter solar power is not up to much, LOL. So my modelling assumes wind power generation, whereas modelling for Australia, where solar will play a much bigger role, will give different results. Wind power, energy storage and back-up can meet demand 24/7/52. My recently extended computer modelling of a wind power, pumped-storage hydro and back-up generators system predicts the following relationships between system features. * Assuming of course that the back-up generation is from renewable energy, such as biomass burning – not diesel, nor natural gas, nor coal nor any fossil fuel. The following graphs show various system configurations for 100% renewable energy generation coping with a low wind weather event, with values scaled to suit UK electricity demand of today. hey nice graph design Scottish Scientist I will be appropriating for by local energy modelling group 🙂 So much easy to read overlaid than stacked. Thanks to Google Sheets spreadsheet charts. Ok i take back all the bad things I said about Google Spreadsheets! Summer wind generation in Scotland is worse. Well this author pointed to summer 2014 as a period of low wind generation in the UK. didn’t cope with a shorter (one month) but even lower wind period in September 2014, pointed out by this author. which is the worst case low wind period I have proved my recommended system configurations on. I rather suspect that a solar-only system in Scotland would require a lot more in the way of energy storage and back-up generators every winter, though I’ve not modelled solar only. I don’t buy all the hype about battery storage or claims that it can be competitive with pumped-storage for large capacity energy storage applications. Lake Titicaca’s water has more gravitational potential energy than the entire electrical energy generated in the United States in a whole year. 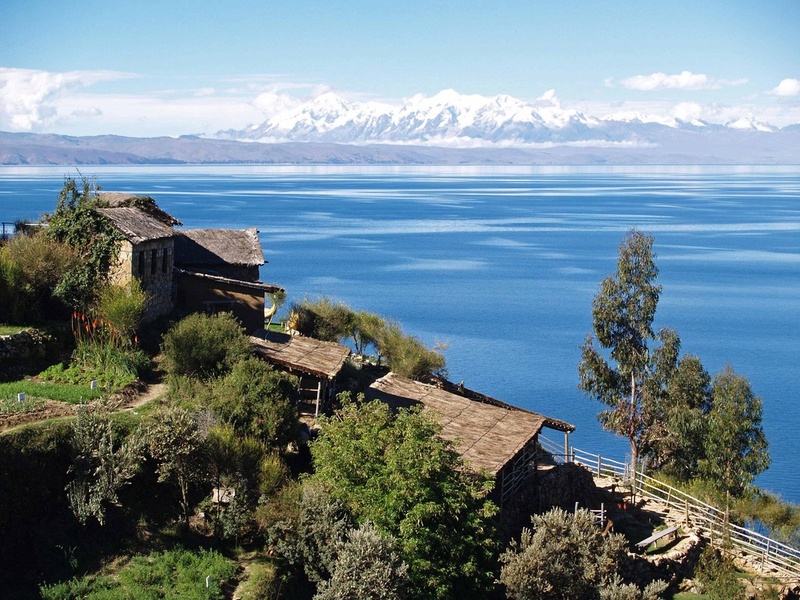 Lake Titicaca was built by nature. It’s there already or it’s free. Now, tell me. Mr Musk, how much would it cost to store America’s annual output of electrical energy in your batteries? How long will it take you build that size of battery and can we get it for free if you miss your deadline? Except it is not in America. And if you drained it how long would it take to fill up again? Well North America can build its own pumped-storage hydro schemes. British Columbia has suitable steep mountains near water. Niagara Falls could be converted to full pumped-storage operation. In a pumped-storage hydro scheme filling up times are similar to draining times. That’s because the reservoirs aren’t re-filled by rainfall but by pumping water up from the lower reservoir. Turn the Niagra into a PHS? Consider the reception in Scotland to switching off the Clyde through Glasgow above tidal run, or the Tweed, the Tay, letting them run dry for half a day, every day? And strongly increasing the flow above average the other half day? Oh I wouldn’t dare to claim the credit for the Niagra PHS proposal. Do you understand what the “Pumped” word in PHES means? Energy, mgh, is half the story. Realized power is the other half, which for hydrodynamics means flow. Fortunately, nature has already designed these long distance spillways, which take into account the local terrain and structural limitations of flow, extending hundreds of km. They are known as major rivers. Do you mean “MWh”? Megawatt hours? is half the story. Realized power is the other half, which for hydrodynamics means flow. You are replying to my comment where I discuss the case of Lake Titicaca? Is that the case you mean? Later in your post you post a picture of the Oroville Dam spillway. Is that the “case” you mean? In this case, the sea is ~ 370 km away from the lake, about a 1% grade. Lake Titicaca is about 300 km from the sea. Orville Lake is 200km away. Neither are “370km” from the sea so I can’t be sure from that what “case” you are talking about. By “grade” do you mean “gradient”? 370 km at a 1% gradient implies a height of 3.7 km which is the elevation of Lake Titicaca so I presume that Lake Titicaca is the “case” you mean? To realize any significant power, a large extended penstock must built to accommodate the required flow, all the way to sea level. How large? Civil engineers move large volumes of water over large distances and a low gradient, by building canals. For the application of moving water for power generation purposes, such a canal is called a “power canal”. 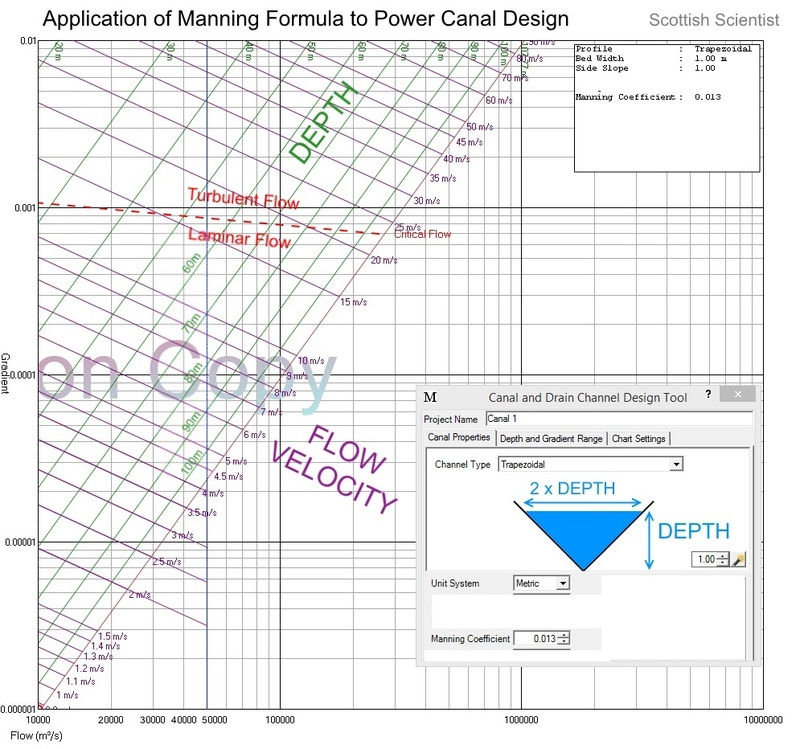 I have published a worked example of power canal calculations in my blog post at this link. Flow rate comparable to the Columbia River in the US for every 10GW of power realized. Expand to 20GW? Build another elevated Columbia sized penstock 2 km above sea level. Maintenance might be an issue. 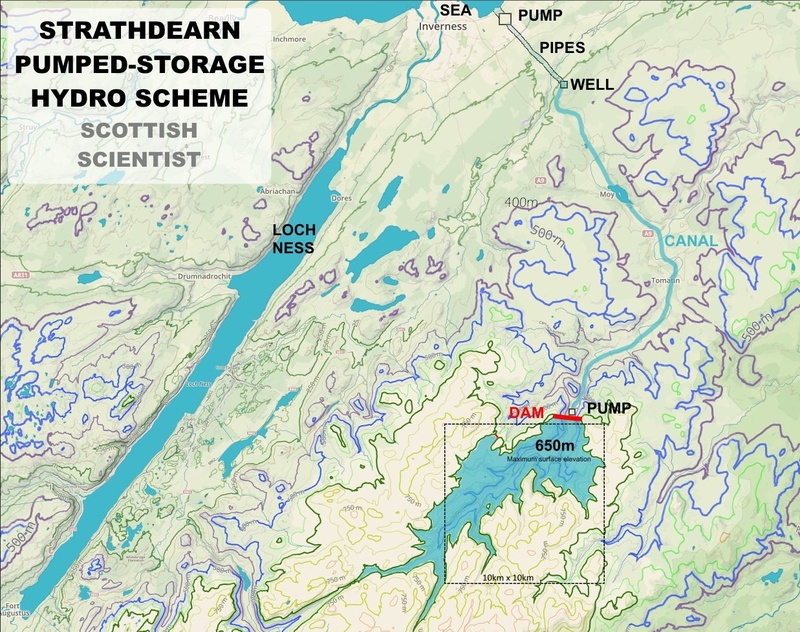 You can see my STRATHDEARN PUMPED-STORAGE HYDRO SCHEME (up to 180 GW / 6,800 GWh) design proposes that the power canal would be about 30km long over level (ish) ground and the “pipes” or penstock are only used over the shorter steeper ground between one end of the power canal at elevation of about 300m down to the sea. The flow rate required for the maximum power of 180GW of 51,000 metres-cubed per second is the equivalent of the discharge flow from the Congo River, only surpassed by the Amazon! Yes I know. I propose a V-shaped canal and a boulder trap at the bottom to trap boulders that will quickly erode the canal lining at higher flow rates. Do you know that the Orville Dam generation complex includes the Thermalito power canal which is tiny by comparison with a small flow rate of only 430 m3/s? You keep using the term ‘canal’. The power obtainable from the flow of the largest canals built are a thousand fold too small. As you say, the flow required is more like an Amazon river, a couple of them. There are no Amazon Canals. The purpose of a “power canal” is simply to move water from A to B (and perhaps later back to A again in the case of a two-way power canal). where the water falls down (or is pumped up) a steep height though somewhat vertically aligned pipes or penstocks which are most definitely NOT “canals” but where the power generated is proportional to the height difference or head of water between the surface at the inlet and outlets of the power station and proportional to the water flow. The water flow in a power canal is simply a conveyor of water to where it is needed. Nevertheless even though the canal is not a generator, it still requires to be designed mathematically so that the water will flow as required. There is no reason in principle why one cannot build as wide, as deep and as long a power canal as in necessary to carry the flow of water required. You say that ‘civil engineers build canals’, to imply the canal for your project would be commonplace. They are not, by 3 orders of magnitude or more. The flow and elevated structure are at least wildly impractical, and probably impossible with reinforced concrete. Even supersized for 180GW, rather more than the UK needs, the Strathdearn power canal construction would be of the same order of magnitude as the Panama and Suez canals by many measures. The Panama and Suez canals might be considered “commonplace” for any self-respecting global economy that needs a short-cut between two continents. The flow and elevated structure are at least wildly impractical, and probably impossible with reinforced concrete. There’s nothing “impractical” about the flow and elevated structure. The flow would be no more than the Congo. Is the Congo “wildly impractical”? I think not! The elevated structure of the Strathdearn canal at 30km and 300 metres is a good deal shorter and less elevated than the Rhine–Main–Danube Canal. the length of the which canal is 171 kilometres (106 mi); the summit elevation (between the Hilpoltstein and Bachhausen locks) is 406 metres (1,332 ft) above sea level. 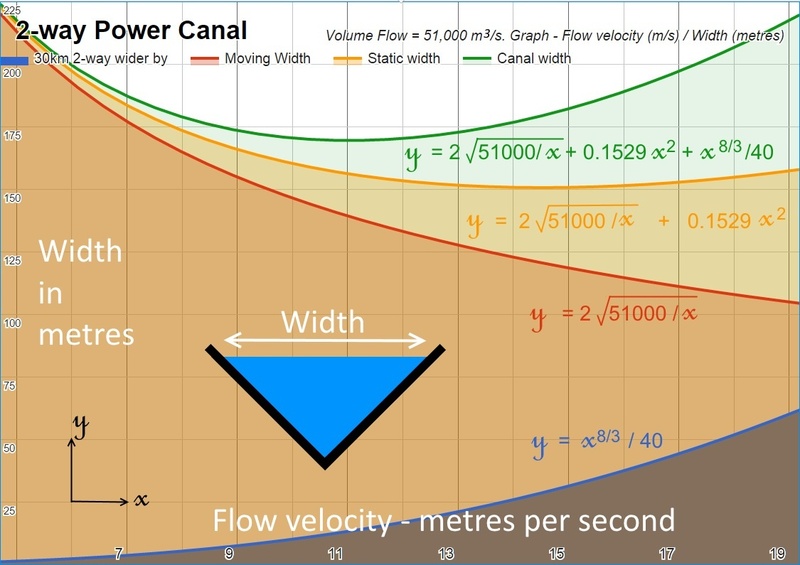 There’s no “impossible” problem with using reinforced concrete lining even at flows of 10 to 11 m/s, the design velocity at maximum flow rates of 51,000 m/s for a 70m deep V-shaped canal because the flow should be laminar (and therefore the flow is slowed at the edges where the water flows past the canal lining) according to the Manning graph I posted. It is fast, turbulent flow as seen in the Oroville Dam spillway which effectively erodes concrete. I have also proposed a toughened lining and a boulder trap at the base of the V that could resist dragging erosion. I don’t claim there are not design challenges when pushing power canals to their limit but solutions are there to be found, even if those solutions are not yet known to all civil engineers. If I can find one site in Scotland for all of Britain’s pumped-storage hydro scheme needs then Australian scientists / engineers can find sites in Australia for Australia’s needs no problem whatsoever. how do the two technologies compare for efficiency? (power out compared with power in) I guess hydro is more variable due to differences in evaporation. Also transmission losses, as battery storage can be localised to where demand is. Both have similar cycle efficiencies but the fact most Australians can’t put a PHES in their garage means they will apeal to different needs. A worry I have with batteries, despite being a supporter is the present lack of provision for recycling. Batteries particularly near the load are much better. The best systems are about 90% efficient round trip, but if located near the load and charged off peak the saving in I2R losses in the transmission network will almost completely offset the storage losses. It would be in interesting data point to report on the cost of retrofitting existing hydro generation facilities as pumped hydro. Of course it would be different for each facility, but the generators are already there, the water is already there, and the power lines are already there. The only thing that needs to be done is to store water at the bottom of the hill and install a pump to move it to the top. In Tasmania we do not even need to do what we suggest. Our system already has lots of hydro power capacity if all storages are full; the role of wind and solar here is mainly to save water, although there are other benefits such as edge of grid support. If Tasmania had sufficient wind and solar so that under the best conditions they covered most of the load, then naturally filled water storages would go a lot further and would have the role of batteries. “Ultimately, it’s difficult to predict how low the cost of batteries may go, but reports predict costs of lithium-ion batteries at somewhere around $120/MWh by 2025. “The Kauai Island Electric Cooperative and AES Corp. announced plans to pair a 28 MW solar array with a 20 MW, 100 MWh battery system to deliver dispatchable renewable generation to the Hawaiian island. KIUC will pay $0.11/kWh for power delivered from the solar-plus-storage system, according to a release, below the cost of oil-fired power that comprises the island’s current baseload generation. Already operational. How have the authors not heard of this?? Better get a new article together on how solar has hit a new low of 1.9c/kWh so that these guys can save face. So yes you’re right it’s not apples to apples, it includes the cost of power and the cost of the storage. All for less than the $200/MWh quoted in the article. I suppose you could nit pick that a very minor portion of the power at 5PM comes direct from the panels. But that would need to have a negative cost to justify the obviously false numbers in this article. Solar PV is 17 MW not 13 MW. It would generate over 100 MWh per day. Hence only half of solar power could be stored in batteries. Hence half would be used directly. Yes there are several mistakes in the article. Often happens. But why would you believe that they would waste half the energy generated? That would be madness. pumped hydro is not cheap to build: $ 200/MWH or more. It suffers from an round trip efficiency of 70 to 85% and is usually located in a remote area. To be economical, it needs to be used to full capacity, on a daily basis. This last point needs explaining: A project like kidston has a storage of 1500MWH , it’s cost $280million, that is $186/MWH. If its storage capacity is utilised to 50%on most days and 100% only sometimes then the cost per utilised storage capacity is $372/MWH. if used for more intermittent storage purposes, say to handle week long power outages, then it might be utilised to 20% on a daily basis and 100% only rarely the cost would be $960/MWH. You can’t have it both ways, either the storage device is used to capacity every day in a time shifting role or it’s used for long term storage as an energy bank. Batteries on the other hand, we know are not particularly cheap, but they are coming down in price (or so the Gurus assure us about battery-Nirvana), they can be plonked anywhere. At the site of generation, at an energy node or behind the meter. There is no pretense about their role. Its purely for time shifting renewables from day to night for solar and similarly for wind. If we look at the data provided by Younicos, battery systems have far better fault response and FCAS events than any other medium. Experience in Ireland also supports this. I expect that expand storage to 20-24 hours from pumped hydro it would be cheaper than batteries but it can only provide inertia services if it is running thereby depleting the primary and secondary capacity. Thanks Peter. Yes, there’s no reason why battery fed inverters can’t provide a short term fault response or something that looks like inertia but I think it’s limited. Let’s talk about fault contribution first. A synchronous machine (such as a pumped storage hydro machine) may provide many times it’s rated current as fault contribution whether it is pumping, generating or in synchronous condenser mode. A battery inverter will typically provide less than 2 times its rated current during a fault, depending on actual declared ratings and capacities etc. So there’s a bit of a difference there. So while it is correct that batteries can provide fault current, it’s not quite equivalent to the contribution of a similarly rated synchronous machine. There’s two main points I would make in relation to inertia. Firstly, there is a question around how well a battery can deliver inertia during faults in weak networks. If the voltage profile dips sufficiently for the battery to go into its fault current response then it may not be able to provide its fast frequency response or inertia. Secondly, it may be that when batteries can provide inertial responses then that response may be superior to that of a synchronous machine by virtue of the controllability of the power output of the battery. The problem for system operators is knowing when this ‘better’ inertia will be available during a fault. If Li-Ion batteries can have a cyclic life of 10,000, why are you stating that batteries would need to be replace once or twice per decade? Please distinguish between variable renewables (e.g. wind; solar PV without storage; run-of-river hydro) from dispatchable renewables (e.g. hydro with dams, concentrated solar thermal with thermal storage; gas turbines fuelled on renewable gases or liquids; geothermal). As the computer simulation modelling by UNSW and numerous other research groups have shown, 100% renewable electricity can be reliable with various combinations of variable and dispatchable renewables. Some of the UNSW simulations achieve reliability with a mix 70% variable and 30% dispatchable renewables (expressed in terms of annual energy generation). Thanks Mark. Yep, point taken on precision with respect to the distinction between variable and dispatchable renewables. Would you agree that the point is valid though? That is, if we rely on an expansion of variable renewables to increase renewable energy then we need more storage which, to my way of thinking, adds a degree of dispatchability to those variable renewables. Happy to discuss further off this forum if you like. Donald, I agree provided the definition of ‘storage’ includes flexible, dispatchable back-up generation, such as open cycle gas turbines using a store of renewable fuels. One of the surprising results of the UNSW simulations is how little storage is actually needed. The claim by some renewable energy deniers, that every MW of variable capacity must be backed up with a MW of storage, is wrong. according to our wise Energy Minister and most of his cabinet every MW of wind and PV needs an equivalent MW of coal or gas running to back it up. Not sure if they mean on spinning reserve or actually generating but either way it’s a furphy that’s never challenged by MSM hosts like Sales, Jones, Alberici etc on our ABC. Several countries of course achieve near 100% ‘renewable’ electricity via hydro, and have for generations, e.g Albania. If you mean that existing minority shares of hydro (e.g the US) can stretch intermittent power (solar and wind) alone to 100%, then no, that’s not feasible; those that have suggested 100% renewable with small shares of hydro have been debunked by dozens of experts. The debate in PNAS about Jacobson’s research on 100% renewable energy is just an academically sophisticated version of debates driven by supporters of nuclear power generallywho appear threatened by the rapid rise of renewable energy. The critics have exaggerated minor issues that don’t change the principal results significantly. However, over 30 computer simulations of the operation of large-scale electricity supply-demand systems in many different regions of the world show that 100% renewable electricity (RE) systems can be just as reliable as conventional systems, even when the RE systems have relatively little storage and no base-load power stations. The UNSW computer simulation studies demonstrating this (Elliston et al. 2012, 2013, 2014, 2016) are peer-reviewed, published in international journals, now span six years of actual hourly data on electricity demand, wind and solar over the region of the Australian National Electricity Market, and use commercially available renewable energy technologies scaled up. Furthermore, the reliable 100% RE systems are affordable (see Elliston et al. 2016 Renewable Energy 95:127-139). Several countries and states/provinces, with small or no contributions from hydro (e.g. South Australia), have already operated without problems on 100% RE for periods of up to one day. The challenges of extending this to periods of years and decades are well understood and solvable with existing technologies, but may require changes to the Market objective and some of the Market rules. Ad hominem attacks on the motivations of highly published peer reviewed authors do not interest me. The finding by Clack et al that Jacobson assumes over a TW of hydro capacity in the US is no ‘minor’ issue. Freed of practical constraints, a 100% RE system with a large share of intermittent sources is likely physically possible without storage and without baseload. However, the assumptions proposed to realize 100% RE are not economicly feasible or desirable. Elliston for instance proposes RE capacity *three* times peak system demand. Elliston also proposes dispatchable sources like biogas, hydro, and solar thermal be built to a capacity equal to peak system demand, though biogas and solar thermal have no significant installation in Australlia. Anecdotal cites of one day performance of small sub-sections of a grid (e.g. SA), otherwise supplied by interconnection to dispatchable fossil power sources are not useful to the goal of decarbonizing modern power grids, amounting to the observation that some days the wind blows hard in some places. Falstaff77, assuming big hydro capacity is a contingent issue, because it’s just one of several alternative options available for firming up the supply system. For instance, part of the proposed hydro can be replaced with concentrated solar thermal with thermal storage, batteries and gas turbines combusting fuels such as hydrogen or ammonia produced from excess renewable energy. Your criticism, based on high renewable energy capacity, of Elliston et al.’s research carries little weight, because the high renewable capacity doesn’t matter provided the system is affordable, and it is (Elliston et al. 2016, Renewable Energy 95:127-139). Excess wind and solar power during periods of low electricity demand can be used to run intermittent loads, such as the production of hydrogen and ammonia, and to operate pumped hydro. The latter option is being investigated in Australia right now, with support from the Australian (and South Australian) governments. S. Australia with its high share of intermittent power now has electric rates at multiples of the rates for states in the east. This argues against the notion that the Elliston cost assumption of RE capacity built to 300% of load are affordable. Expensive power solutions guarantee continued fossil use in the developing world for many decades to come. Falstaff77’s ill-informed claim re SA is inconsistent with the empirical facts, as regular readers of RenewEconomy understand. For example, in 2016, wholesale electricity prices were often higher in Queensland, which has very little wind generation — see https://reneweconomy.com.au/energy-prices-in-nsw-qld-twice-as-high-as-south-australia-84151/. However, occasional spikes in SA wholesale electricity prices have been caused by gaming by the big gas generators. Averaging over past decades, South Australia’s electricity prices were generally higher than in eastern states, long before wind became a significant generator, because SA has a higher fraction of expensive gas generation than the eastern states and because its grid is smaller and so it misses out on the benefits of scale. As a result of the Merit Order Effect, the large fraction of wind energy in SA has reduced the wholesale electricity price below the level it would otherwise be, see https://reneweconomy.com.au/agl-energy-squeezed-by-the-merit-order-effect-84857/ and https://reneweconomy.com.au/wind-solar-force-energy-price-cuts-in-south-australia-39705/. This effect is even observable in NSW with its modest wind energy contribution, see https://reneweconomy.com.au/the-myth-around-australias-cheap-energy-46981/. The Merit Order Effect is well-known in Denmark and Germany. Unfortunately the reductions in wholesale prices are not generally passed on to retail customers. To forestall the renewable energy deniers’ perennial false claim that high retail electricity prices in Denmark are the result of its high fraction of wind energy generation, it should be pointed out that Denmark has very high taxes on electricity that go into consolidated revenue. If we compare tax-free retail electricity prices across Europe, we find that Denmark’s are in the middle, despite the small scale of its grids. Also a big critique of Jacobsons hydro was that they can’t scale existing dams with more turbines ten fold. But that ignored the fact that off-river PHES can scale much more than on-river hydro, as long as there is rain once in a while to top up from evaporation. They’re cycling the water, if every second day thats 182 days in the year, as opposed to river hydro which use each water molecule only once (until a rainstorm bring it back again). Underground mine sites and floating PV arrays reduce evaporation too. The “fallacy” fallacy is your favorite logical mindbender to deploy, falstaff77. Just because we don’t have a 100% RE grid in Australia does not mean that progress towards a 100% RE gird isn’t significant nor that 100% RE is impossible. Many models have shown 100% RE is technically achievable given the weather data for a couple of decades and projected demand curves at economically feasible costs, especially if one were to consider the health, environmental and climate costs of fossil fuels. I don’t know what cost you’d put on almost every endemic species in Australia gone by 2070 and 50% by 2030, but that’s what we’re tracking on according to CSIRO research. Do you live in Australia, are you aware of how politicised the whole issue was by the reactionary conservatives in the Liberal Party who work for the coal industry? For someone who calls other people “shills for the coal industry” you do a pretty good impersonation of one. No, thats over after Clack et al 2017. There are no more valid 100%RE models for heavy fossil countries. Every model has limitations and the Jacobson model was not a deep model, more indicative of what would be required. Even if I accepted that that model was entirely discredited (which I dont) it has zero bearing on other models. That those paid by the nuclear industry to model in their prefered scenarios had kittens comes as zero surprise. Of course 100% RE is possible, two states in Germany are living proof. It’s all about optimising the costs and minimising the pain during the transition. You are losing credibility by the second. There are many models in Australia using credible 30 minute weather data and historical demand data from the last decade and more. There are no 100 % RE *annual* states in Germany, or anywhere else in the world, that are not mostly hydro. Again, as late as this past December, there were a dozen days where wind was approximately zero for the entire German wind fleet, and here you are claiming 100%RE. If there were sucessful data, you and every other advocate would *actually show the data*. According to you, journal published work that you do that understand and written by some the world’s most renowned scientists is “paid” for by the nuclear industry, Germany has 100%RE in states, but it is others that lose credibility. This is anti-science, fanatic nonsense. The authors have stated that battery storage costs are $350 to $1000 per MWh. The Elon Musk “bargain basement” battery offer to South Australia was USD250 per kWh. (AUD300 per kWh, or AUD300,000 per MWh). So the authors have understated battery costs by 1000 times. Consequently this article, together with all the following comments, are entirely useless.